As part of UNHP’s continued effort to assist Bronxites throughout their homeownership journey, UNHP held a two-part First-time Homebuyer FastTrack Series on May 1st and 19th at Concourse House. Through rain (Saturday) and shine (Tuesday), about 70 interested homebuyers attended at least one of the two events and came ready to learn and make plans for the next steps towards homeownership. The first of the two homeowner events was a homebuyer assessment. 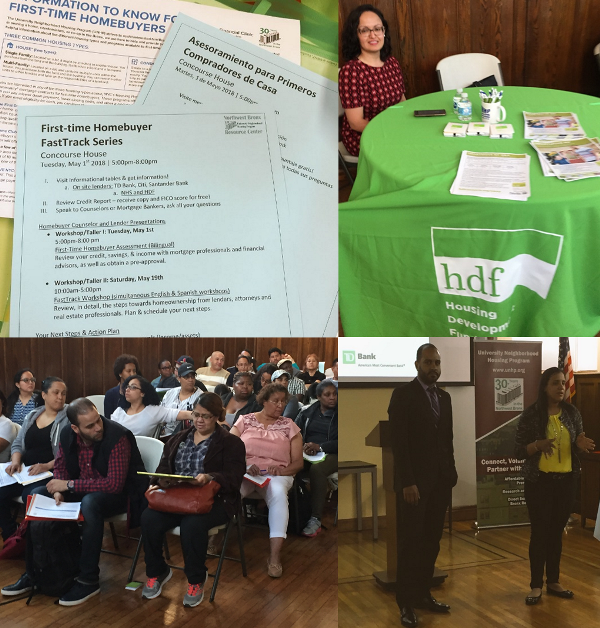 Presentations by TD Bank, Santander Bank, Citi, Neighborhood Housing Services and Housing Development Fund provided the 35 attendees with an overview of bank requirements and the special incentives, loan and grant programs available to first-time homebuyers in NY. Ariva and UNHP provided credit reports and opportunities for follow-up financial counseling to the interested buyers. On Tuesday, May 1st, attendees were able to assess their mortgage readiness and learn about the home-buying and mortgage process and find out about special programs, low-interest loans, and grants available for low-to-moderate income first-time buyers. Jumelia Abrahamson, UNHP’s Northwest Bronx Resource Center Director and NeighborWorks Certified Pre-Purchase Counselor guided participants through a homebuyer tool and shared UNHP’s BronxOwner Guide. Both Ariva and UNHP provided soft credit report pulls along with a brief analysis. Both groups offer opportunities to work with a financial advisor to improve credit, including 1-on-1 meetings with a financial coach, Ariva’s WE Master Credit workshop and UNHP’s Getting Ahead Financial workshop. The slideshow (below) offers a glimpse into the well-attended evening. During the rainy Saturday, May 19th session, attendees received in-depth information about the mortgage process and sat in on presentations from attorneys, inspectors, and realtors about the homebuying process. TD Bank led the workshop in Spanish, as Santander Bank led the English language workshop. 10 participants, who attended both sessions (May 1st Homebuyer Assessment and the May 19th day-long workshop) received a UNHP homebuyer certificate they can use on the road towards owning their own home. The brief slideshow (below) features pictures taken during both the English workshop with Santander and the Spanish workshop with TD Bank. TD Bank, Santander Bank, and Citi participated in the presentations and offered individualized information to attendees. Neighborhood Housing Services of New York City (NHS) and HDF: The Housing Development Fund, Inc. provided information about grants and low-interest down payment assistance loans and products. The attendees at both events were fully engaged at the two workshops. Interested homebuyers were able to discuss the home-buying process in both the group sessions and 1:1 discussions with bank and nonprofit home-purchase specialists. UNHP looks forward to working with the participants as they boost their savings, improve their credit and look for homeownership opportunities. Seven attendees signed up to get a mortgage pre-approval and three signed up for the Home Club savings account. Seven attendees also signed up for the Getting Ahead Financial Education workshop, which will help them continue to improve their finances. Thanks to TD Bank, Santander Bank, Citi, NHS, Ariva and Housing Development Fund for sharing your homebuying resources with prospective Bronx buyers.